Got the smoked lens together with relay + under tail closeout and axle block. Really worth the wait about 2 weeks to my hand. Now my bike look awesome and completely stunning from other 09 college here! Advantages: Easy installation with provided Youtube guidance. Love these. Great shipping time and easy plug and play install. Wow! Speechless... This bright integrated light along with the fender eliminator give the MT09 a complete makeover. It’s like a facelift for the MT09 but at the rear, a tail-lift. My MT09 has attitude now with such an aggressive look. Advantages: Super bright leds with flashing features are sure to grab any drivers attention. Awesome fit. Could not ask for a better looking and functioning tail light. Advantages: No more Pumpkin signals. Looks better than Stock. Disadvantages: no license plate light integration. They do offer a universal one, which i have installed. Just hate seeing the wire going under my fender, but it is what it is. Really cleans up the back of the bike. Looks nice, perfect fit. Customer service is top notch. Talked with a rep over the phone. Super friendly, very helpful and he rides... can't really ask for more. Needed some extra hardware out of a kit, hooked me right up. First impression of the company is a solid 9 out of 10. I installed the smoked version on my 2019 MT 09 along with the fender eliminator kit. IMHO this is the best taillight I have seen for this bike. 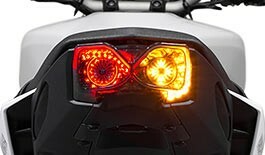 It is bright and the various brake and blinker flash options should have something to please every rider. Install was a breeze and once again you cannot beat TST's install videos! Disadvantages: Haven't found any yet. I bought the integrated taillight, GTR front turn signals, flasher relay and complete fender eliminator kit for my 2018 MT-09. I’m totally stoked with the design, quality and fit of everything. Really gives the bike a sweet look. In my 45 years of riding and modifying bikes this is the best design I have ever seen in aftermarket parts. The videos are fantastic and made install soooo easy. Everything fits and works so well. Love the taillight adjustment options and the adjustability of the flasher. Thanks so much for the time spent in the design. Advantages: Really cleans up the looks getting rid of the antiquated turn signals and rear fender. Design really works with the FZ/MT-09 factory design. Disadvantages: Not a thing. This is how the bike should have been finished at the factory. I installed the Integrated tail light over the past weekend on my MT 09. My god...it changed the whole look of the vehicle. Getting rid of those large pumpkins was such a huge relief and boosted the looks. Its so much cleaner now. TST industries product build quality is top notch..!! I did not have to make any additional adjustment or cable splicing etc. for this replacement. I even got the flasher relay and the under-tail close outs to fill up the gap from OEM turn signals. Everything fits perfectly. The most important piece to all of this - the instructional video. Makes it so damn easier to understand and do it yourself. Disadvantages: None from what I see so far.